Located in Bridgewater Township, Rice Creek is a 7-mile-long stream that flows into the Cannon River northeast of the City of Dundas. 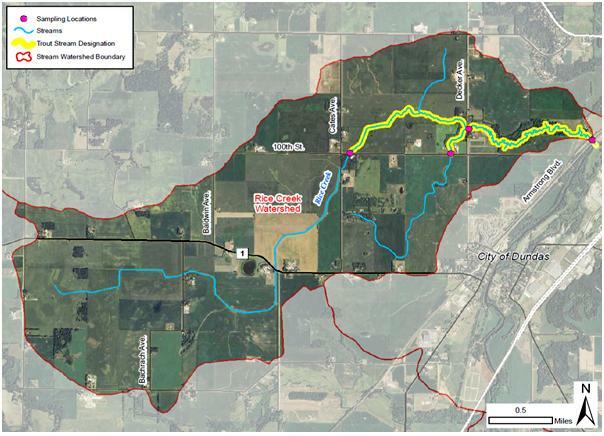 A portion (1.9 miles) is designated as a trout stream (yellow line on map). This means it is a high priority for protection. It is the only cold-water trout fishery in Rice County. Rice Creek has long been prized by anglers, conservationists and other like-minded people. That’s because this beautiful cold water stream is home to native brook trout, or “brookies”, making it a treasured habitat in southeastern Minnesota. Brook trout need cool, clear, well-oxygenated streams with high water quality, suitable sand and gravel riffles for nesting, and plenty of aquatic and terrestrial bugs to eat. The brook trout in Rice Creek face threats from increasing water temperatures and sedimentation due to storm runoff and climate change. Unfortunately, the stream is impaired with nitrates, turbidity, and E. Coli. For over 15 years, CRWP and local residents have been working to protect this unique habitat. 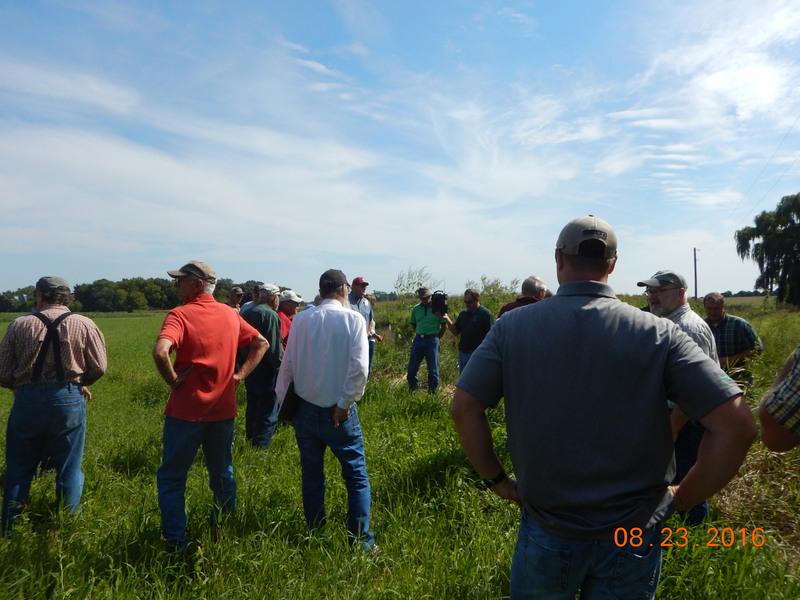 With support from the Fishers and Farmers Partnership, CRWP is partnering with farmers and landowners in the Rice Creek watershed. We are implementing innovative conservation practices to reduce peak runoff flows, soil erosion, and nutrient pollution. This program is providing funds for cover crops, strip-till and no-till, conservation drainage structures, and buffers. Participants in CRWP’s Buffer Field day get their questions answered. The Cannon River Watershed Partnership offered an event, “Buffer Field Day,” on August 23, 2016. This event provided information to landowners and farmers in Rice Creek Watershed and surrounding areas about soil and water conservation practices such as perennial vegetation buffers, which help protect brook trout by filtering storm water runoff. Sponsored by a Fishers and Farmers Grant from the U.S. Fish & Wildlife Service and co-hosted with the Rice County Soil & Water Conservation District, the event was held at the Daly Farm at 10163 Cates Avenue, Northfield, Minnesota. While enjoying the ambiance of a charismatic historic barn renovated for events, participants learned about why buffers are important. Additionally, they learned about programs that support buffer installation, and answered their individual questions about requirements of Minnesota’s new buffer law. Hands-on demonstrations of stream hydrology and a walking tour of nearby buffer sites complemented this informal learning opportunity. Read about this event in the Northfield News. CRWP, Bridgewater Township, St. Olaf College and the Rice Creek Concerned Citizens Group completed a study in June 2013 that evaluated the current health of Rice Creek. They evaluated the creeks health from several directions:conducting biological and habitat assessments; studying food web structure and interactions; collecting bugs and fish; monitoring stream flow and water quality; profiling stream temperature; and identifying groundwater sources. Information gained in this study provides a valuable baseline before development and restoration activities, and will help guide activities to improve and protect the future ecological health of Rice Creek.